Whether it’s to listen to music or just to use the GPS, the mobile phone has slowly but steadily earned its place in a world where there is an increasing demand for cycling. Whether you cycle as your main means of transportation, an escape or a workout routine, having a phone handy is quite necessary to make the cycling process as modern as possible. And with a bike phone mount, you can take your cycling comfort to the next level. If you are convinced about the benefits and keen to get your hands on one, continue reading to find out the best bike phone mounts on the market. We do not take the title of best bike phone mount lightly, there is no doubt that this bike phone mount is one of the sturdiest pieces of equipment on the market, even the clumsiest of cyclists can maneuver this phone holder without a hitch. Not only does this TaoTronics phone holder for bikes keep your phone safe and visible at all times, but it also comes in different sizes and forms to accommodate several phone brands. No matter the type of terrain, you are guaranteed the 100% safety of your phone with its non-slip rubber grip cradles. Seeing as phone safety is ultimately the most important thing for most users when they are looking to purchase the best bike phone mount, it makes sense that this bike phone mount emphasizes safety above all. After all, no one wants to pick up the pieces of their phone after encountering a bump on their biking trail and as such, this is one of the most viable options out there. This model is not only efficient but easy to use and install due to the fact that it requires no tools and as such, it is definitely a must buy item for all bike users. To top it all off, this bike phone holder allows for the best view you could possibly have of your phone; it is fully rotatable by 360 degrees giving users the flexibility they need to operate a mobile phone on a bike. And it is suitable for your mountain bike as well. This phone mount, albeit for cars, has made it onto this list for its efficiency and uniqueness when it comes to securing your phone in a moving vehicle. This product provides the all-around ease that users look for in a phone mount all wrapped up in a compact piece of equipment built for convenience. The fact that this phone mount is magnetic is the icing on the top of the cake, gone are the days that grips were used to hold a phone in place, the inbuilt magnet makes it easier to secure the phone, thus eliminating the possibility of the phone falling down and in turn, sustaining any damage. The fact that it can easily rotate makes it easy to manipulate even while the vehicle is in motion and as such limits the number of phone-related car accidents or car related phone accidents. This is because the base of the phone mount is sturdily fixed to the air vent of the vehicle and as such, it remains stationary in the position the user prefers no matter how much movement is involved. There may be doubts about how the magnets incorporated in the device affect the mobile phones themselves, but the good news is that the magnetic technology is totally safe to use and no harm will be sustained by the smartphone. Not only is it safe, but it is also as sturdy as can be; fashioned with carbon steel plates, these phone mounts are designed with ‘powerful holding power’ in conjunction with technology that absorbs magnetic instability. 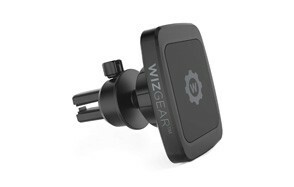 All in all, this a very easy device to use, there are no complicated guidelines or do’s and don’ts; all the user needs to do is to place the phone close to the mount and the rest is in the ball court of the WizGear Universal Bite-Lock Air Vent Magnetic Phone Car Mount Holder. This also makes a perfect gift for mountain bikers in your life. Immovable rubber base in conjunction with a powerful magnetic head for holding smartphones. This bike phone mount has definitely earned its place on this list, this highly efficient model has everything a cyclist needs to enjoy his/her phone to the fullest. First, it is easy to install on any handlebar thanks to the sturdy velcro closure strap, which has the added advantage of being adjusted to fit perfectly on the handlebars. 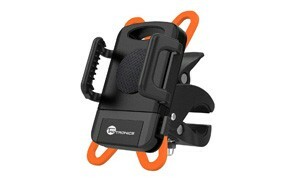 In addition to that, this Wallfire Bike Phone Mount Bag also supports handsfree usage. One thing that makes this particular device stand out among the rest is its total capacity; in addition to the actual phone, there are a number of things that can be stored inside this device. Users can also place power banks, spare bike lamp batteries or even emergency tools in it, as such, this multifaceted device opens the doors of new possibilities when it comes to bike phone mounts. When using this product, one can be rest assured concerning the overall safety of their mobile phones, not only is it as sturdy as they come, but it also has a waterproof zipper which protects the phone against the elements, come rain or sunshine; it also comes with a sunshade/visor which helps with the overall view of the phone’s display screen, so say goodbye to all that squinting and looking for the right angle. To top it all off, this bike phone holder allows for touch operations on mobile phones with the bag on. If you love riding a bike, make sure you equip your bike with a good bike light from our list, as well. This is another bike phone mount that has definitely been tried and tested, its aluminum alloy frame makes it one of the sturdiest pieces of equipment on the market, this does not take out of the general stylishness of the device itself as it is said to be fashionable and simple. It is truly as practical as they come, which means you can say goodbye to the days it was unsafe to handle a mobile device while out on the open road as this phone mount can be fixed both vertically and horizontally according to the user’s preference. It also allows for the adjustment of the display to the most suitable angle, making way for safe hands-free phone access while on the road. 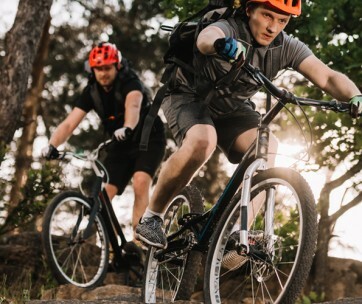 The safety of any given mobile phone is completely guaranteed when using the GUB mountain bike photo mount and to top it all off it has multiple protection in the form of four edges designed with eagle claws, and an embedded cross-shaped structure which enables it to fit into its given pedestal. That is not even the end of it; this device equally has a cushioning adhesive patch for its clamp embedded in order to reduce vibrating movements in addition to any phone surface scratches caused by the latter. So, you see, if there is a safety issue when it comes to bike phone mounts, the manufacturers of this stellar product have got it completely covered. The cherry on top of all this is that this device is that it has easily adjustable settings seeing as it is universally compatible; fit for both mobile phones and GPS models within the width of 2.17 inches to 3.94 inches. If you were wondering, that covers a whole lot of ground; both Apple and Android cell phones as well as GPS’ fit into this range. Be sure to also check out guide to the best bike locks for more great bike products like this. This next phone bike mount is the perfect fit for all cycling enthusiasts everywhere who are looking to incorporate their mobile phone into their regular cycling routine, be it for answering calls, listening to music, using the maps or telling the time. This is definitely the device to get all this done with ease. This device may not be boast of being compatible with all mobile phones, but it definitely fits most of them given that they are within the screen size range of 4.7 inches to 6.0 inches, in the same vein it is also compatible with most handlebars which have diameters within the sizes of 0.66 inches to 1.96 inches. The STOON bike phone mount is equally as sturdy as can be as it is fitted with strong and long-lasting silicone bands embedded with a shock absorbing clip designed to hold each corner of the given mobile phone securely in place, the cherry on the top is that this bike mount comes with 100% insurance for your device in the event that there is an occurrence of an accident or loss. That is not all this amazing device has to offer, it is also as easy to install as ever, all the user has to do is to tighten the clamp and allow the bike phone mount to do the rest. To crown it all, this device offers 360 degrees rotation to furthermore achieve full access to the screen. This is achieved as a result of its rotation band design which allows the user to adjust the display to his or her desired preference, be it in portrait or landscape view. This makes way for any biker or cyclist to use their mobile phones while in motion with no hassles getting in the way. 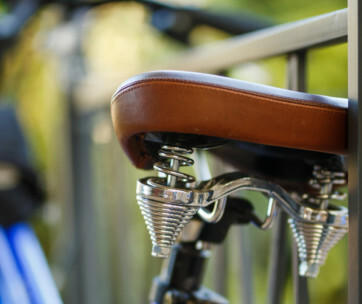 If you want to upgrade your bike even more, choose one of the bike seats from our list. TaoTronics is as good a brand as any other, if not better, and this particular product is a testament to this fact. This affordable piece of equipment is top of the notch with multiple protection in the form of a silicone pad, a grooved clip as well as silicone grips which all work hand in hand to keep the mobile device securely in place. Despite the fact that there are numerous mechanisms in place to secure the mobile phone, the TaoTronics bike phone mount was designed for easy release in the case that the user wants to disengage their device from the phone mount. This process involves a simple one-button release that enables the user to retrieve their phone easily without any form of damage, no matter how minor. Worried that this device may not be compatible with your phone? Well, it has a pretty broad spectrum when it comes to screen size compatibility; its grooved clip arms conveniently fit phones from 4 inches to 6.3 inches, so if you have anything ranging from an iPhone 8 plus to a Galaxy S9 (and more), your mobile device is totally covered. 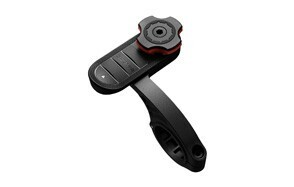 In addition to that, this bike phone mount is compatible with a wide range of bike handles as the clamp of the phone holder itself adjusts from 0.6 inches up till 1.5 inches, so there’s is no doubt that your bike handles land somewhere within this range. To crown it all, this device easily rotates up to 360 degrees allowing the user the luxury of having it placed in the view that is most convenient to them. 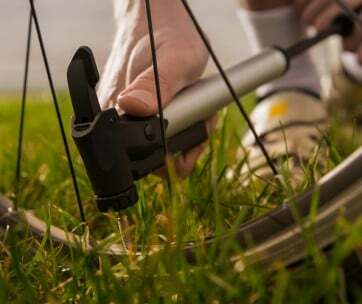 Our handy guide to the best bike pumps features more great products like this. This is the newest version of this stellar device and you best believe that it comes with new and improved features to make any bikers total experience as memorable as can be. The Visnfa New Bike Phone Mount comes in an x-shaped design that allows for four corners of stainless steel clamps which in turn hold on to any mobile device ensuring the complete safety of any given mobile phone or GPS device. As you may have guessed., there is more to the four steel clamps than what meets the eye, the switch controls the four arms open and this mechanism is useful for both adjusting the size of the device to fit different phone sizes as well as for securing mobile phone in place while the bike is in and out of motion. With most of these devices, durability is a big issue, but this new and improved version has got that front covered with its highly elastic clockwork to automatic contraction clamp arms. This mechanism makes the overall usage of this bike phone mount as convenient as possible for cyclists and bikers as a whole. Not only is it easy to use but it is also easy to install on any bike handle once the lock nut is located, in addition to that it is compatible with any device which falls between the range of four to seven inches. This device pretty much does all the work for you. The extra plus side here is that there is a 12-month guarantee on this product and as such, it can be returned easily if the user is unsatisfied with it. Find more amazing products like this by checking out our guide to the best car bike racks. The name says it all, this bike holder comes in a simple and straightforward model suitable for users everywhere, it is also compatible with mobile phones and GPS devices that are up to 3.5 inches wide and it is a perfect fit on handlebars with a diameter of 0.7 to 1.3 inches. In addition to this, the bike phone holder can be used on a number of bikes and bicycles, some of which are commuter, mountain, and electric bikes, as well as classic, Harley, and touring motorcycles. The materials used to make this device were not picked at random, they include; premium hard plastic as well as an anti-slip stretchable rubber band, a silicone net which makes for a sturdy and stable bike phone holder and a pretty stretchable one as a whole. The AmazonBasics universal phone mount holder allows for 360 degrees rotation and as such enables the user to pick the view that suits them best, be it horizontally or vertically, in fact, if you want to go all out and have it placed diagonally this is the bike phone holder for you. In addition to the fact that this product is as versatile as can be, setting it up is as easy as ABC, there is no need to make use of any tools whatsoever. In the rare event that the device sustains any damage, provision has been made for a one-year limited warranty. If you are a passionate biker make sure you also check our guide to the best cycling gloves. This particular item has made it on to this list of best bike phone mounts for viable reasons, take for instance its fiberglass core which makes this device highly resistant to extreme conditions, be it terrain or element related, at the same time remaining as light as possible for convenient use. Another unique attribute of the Gearlock Out Front Bike Mount is that it has an aerodynamic build and as such carries out every ride at a high performing level; in addition to that it has an easy to execute one-click system that is powered by an ergonomic mechanism which protects the phone all round and enables the user to have easy access it before, during and after rides. The issue of bike mounts being incompatible with the bike handles is not even an issue in this case because in the event that the size of the handlebar is below 31.8mm, there is the included spacer which can bridge that gap. This piece of equipment takes further takes the issue of compatibility to a whole new level as it has a universal mount adapter which can be used in conjunction the user’s current case to make proper use of the Gearlock mount solution. Brand - Brands go a long way in shaping the way we think about or completely perceive a product as a whole, this is probably because different brands set standards to which their products typically adhere to. As such, when picking the best bike phone mount, we had to consider brands that are well-known for producing sturdy and long-lasting bike phone mounts as a whole. Just to mention a few; Gearlock, Wallfire, Stoon, and TaoTronics are all big names when it comes to this particular bike accessory and you best believe that they live up to their names. Reviews - Customer reviews have become the one true way to find out whether the product truly does live up to its expectations. Of course, companies will have totally good things to say about their products, at the end of the day they need to make a certain number of sales to keep their businesses afloat as well as turn a profit, as such one must look to the testimonies of every user to find out the truth. No product is completely perfect, but all the ones that made it to this compilation definitely have the pros outweighing the cons and as such, you can rest assured that you are getting a stellar product. Price - Everyone has different capacities when it comes to money and as such, the products on this list include items with prices that range from high to low. There is no way that you will look through this selection without finding something within your range and of pretty good quality too. Just as there are different phones and bikes, there are different bike phone mounts that match their features, hence, when you are in the market for a new bike phone mount here are some things you should use as a reference point. Compatibility - When it comes to a bike phone mounts, there are so many layers to compatibility as a whole. You have to ask yourself two questions; will this fit your phone screen size, and will it fit on your handlebar? These are things that have a wide range of sizes and as such buying the wrong one could result in the damage or the loss of your mobile device altogether, not to talk of the dissatisfaction that comes with buying something you need but cannot use. Checking the statistics to ensure compatibility is definitely at the top of the list of things that need to be done before making this purchase. Materials - This is not only a matter of preference when it comes to bike phone mounts but also one of safety and durability in a nutshell. Some materials are not sturdy enough to stand the test of time talk less of a really bumpy ride, some are too aggressive and as such, the phone or GPS device may receive some of the worst scuffs and scratches yet. When in the market for a bike phone mount, it is wise to pick one made of materials that will enhance the longevity and safety of your mobile device. They also need to last long seeing as no one wants to break the bank on account of bike phone mounts. Visibility - One of the main uses of a bike phone mount is to keep the phone visible with as little manipulation by the user as possible, this purpose would be completely defeated if the user were unable to see the phone or GPS. Thus, it is wise to check for models that place emphasis on how well the viewer can see the phone itself. For the layman, a bike phone mount is simply a bike phone mount, but in actuality, there are different types, hopefully, this sheds adequate light on them. Case and mount - The name is pretty self-explanatory; this type of bike phone mount comes along with a case for the phone and as such, these are pretty phone-specific. Having these cases attached is most advantageous as it does provide additional protection for the phone and makes it easier for it to be held in place. Universal bracket - This type of phone mount is quite prominent in the market; it allows the user to adjust the bracket to fit whatsoever phone they have. Some of these devices have wider ranges of size than others do, but all in all, there is a limit to how adjustable they are as a whole. Frame bag - This usually comes in the form of a pouch that you can fit your phone alongside other items into and then, in turn, attach to your handlebar for hands-free use while in motion. They are a little snugger for the phones as they totally encase them and as mentioned earlier, can be used to store other useful cycling related items. Q: Why Use A Bike Phone Mount? A: There are a number of reasons why bike phone mounts have become popular. In this digital age being without a phone even if it’s for a while can prove to be quite the hassle. In addition to this here are a few reasons that bike phone mounts have become a thing. Safety and accessibility: Admit it, even when you are cycling, and a phone call comes in there is that urge to pick it right up there and then. This can be very unsafe both for the rider and the phone itself, but bike phone mounts eliminate that concern by holding the phone in place while you go about your call answering business. It also makes it easy for you to perform other phone related actions totally hands-free without jeopardizing your safety. Comfort: Gone are the days of stuffing your phone in your pocket or bringing along a bag to place it in, now you can have it attached to your bike as if it was inbuilt.